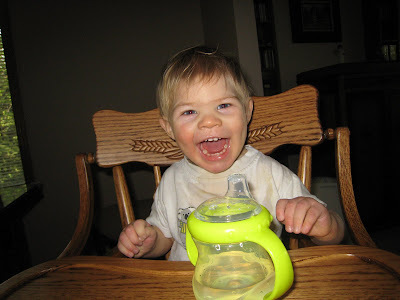 I asked Elijah's speech therapist a couple weeks ago if she had any advice about sippy cups. You see, Elijah can't yet feed himself in any sense of the word - not by picking something up, by using a spoon, a bottle, or a sippy cup. Elijah can drink from an open cup, which is actually a really great skill (more advanced than drinking from a sippy cup), but he needs help to do so and is pretty messy. Not that we mind giving Elijah his drinks, but it probably goes without saying that we're a bit anxious to help Elijah learn how to give himself something to drink. That's why I was so excited to see Elijah put this sippy cup (called a Nuby) in his mouth. No, he hasn't given himself something to drink just yet, but I am sure that he will...and that is more than good enough for me. Watch the man in action yourself, but beware of the mommy voice, the questionable camera skills, and extreme cuteness. It took Weston quite a while before he actually drank from a sippy. He was far more interested in playing with it and dumping the drink out all over the floor! It is soooooooooo nice when they can drink for themselves... the things you appreciate when you are a mom!